A new volume by C+T Publishing, and it is a beauty!! The Embroidery Book, by Christen Brown, has the subtitle, Visual resource of color and design, and that's what makes it a treat far different from many embroidery guides. The guide comes first so that you can figure out immediately what stitches you want to learn. 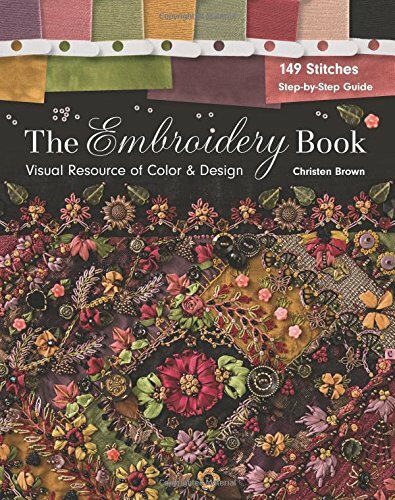 There are 149 stitches covered, with step-by-step instructions and so many lush lush lush examples that you will just be aching to expand your repertoire! I would say that this book would be best for those who want to take the stitches that you know, learn more, and design projects for yourself. It is not an exhaustive guide, but it has lovely sections that cover a brief history, materials and tools, color theory, design basics, specific design compositions and color schemes that work, and different embroidery applications (including straight seam, crazy quilt, applique, trims, borders, etc). 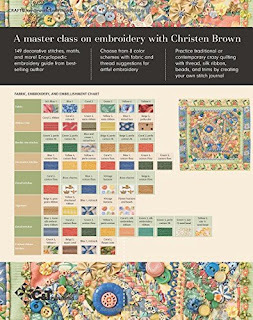 If you do not have a good embroidery reference work, this may be exactly what you've been looking for! Thank you so much for this glowing review! I hope that you enjoy the book for years to come. And thank *you* for writing such a gorgeous book! I just requested this from our library! So glad you posted on it. I was shocked they had it in our library!!! thanks again!